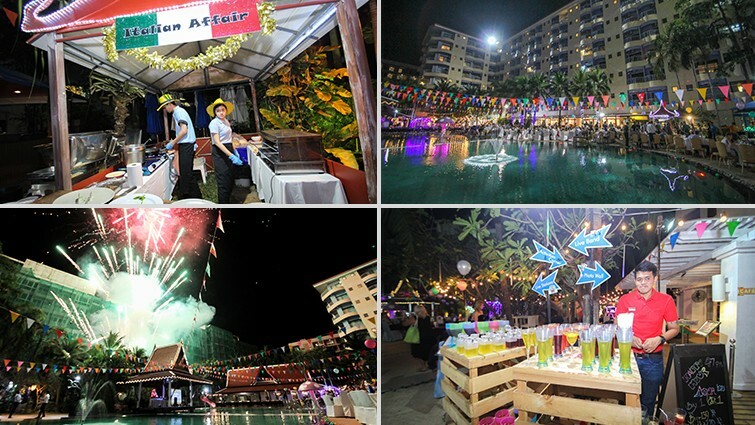 This New Years Eve in Pattaya, celebrate with your family and friends the best New Year’s Eve buffet in Pattaya. Building on the success of last year, where we held the Mercure Carnival on the back of the prelaunch of Aqua Pool Bar & Club, this year we have taken it up a notch with our C3 (three cube) concept. The crux of our C3 concept is based around “Celebration, Culture, and Community”. In this event, we are highlighting and celebrating 3 distinct cultures that are well known in all of Thailand over the years. As we head into the New Years Eve in Pattaya, we invite all of you to celebrate the best of these 3 cultures at the Mercure Pattaya Hotel. From Loy Krathong to the Dragon Dance and a touch of the festival of lights, experience a variety of cultures under one roof on the biggest night of the year. The 3 cultures will be reflected in our food, decorations and set up at the hotel. Eating is a central part of these festivities, and feasts will be prepared that is set to delight all your taste buds. This is also a time to exchange gifts and sweets as well, so the hotel will be organizing a big lucky draw where you can win some exclusive and amazing prizes as well. Available on 31th December 2018 from 6.30 p.m. to 2 a.m, the New Years Eve International Buffet Dinner is priced at THB 2,100 net per adult. The free-flow alcoholic package is available at THB 1,000 net per adult. Children under 6 years of age can dine for free and chargeable for children aged 6-12 years at half price.